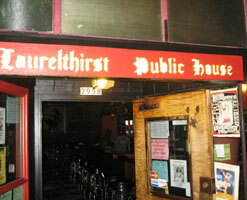 Our first gig at the historic Laurelthirst Public House. As it had been nearly a month since our last gig, and having the night all to ourselves, we felt the urge to jam things out a bit. And.... jam we did, producing one of our more improv-oriented shows of 2008 so far.